Last Edit: 22 Jan 2015 12:21 by remo. This bounced off support @ 364.5p. Great call on this by WS(see below). Last Edit: 05 Sep 2014 09:20 by WaveSurfer. IMO technicals are only of partial use here. The bad news is not quantifiable, so neither is the bottom. The only way to play this long is to play the bonces and that is dangerous. 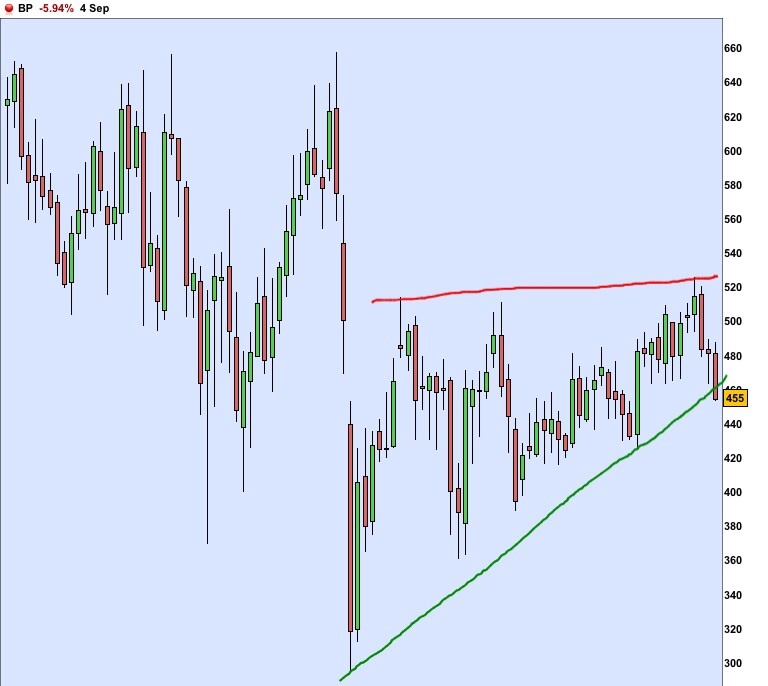 Shorting a retest of the broken trendline is safer, but still very risky. I am not a gambler so not for me. i did't go long, i was just thinking about it. This is in a downtrend, and has some way to go imo. Thinking about a long @ 455p. Probably a bad idea to catch a falling knife, so going to leave it for now and see where this goes. The reason for the drop, is BP have been found guity for the Gulf oil spill in 2010. Last Edit: 04 Sep 2014 15:50 by Trendfriend. 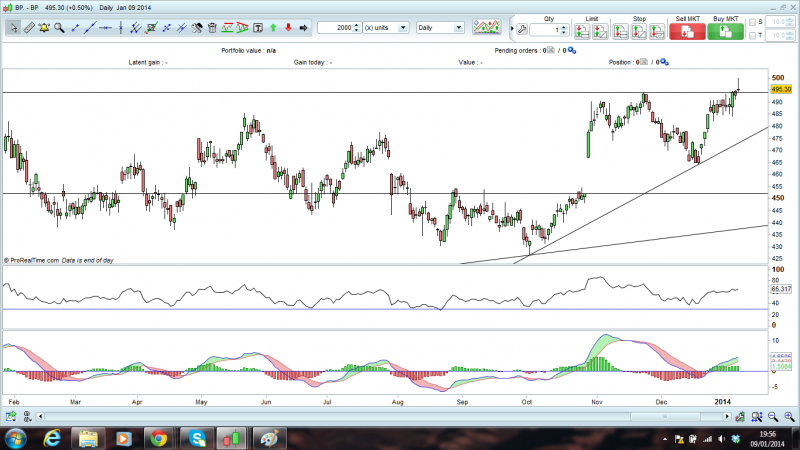 Near resistance, possible 123 low breakout..one to watch. Day trade only, as indicators still look bearish. 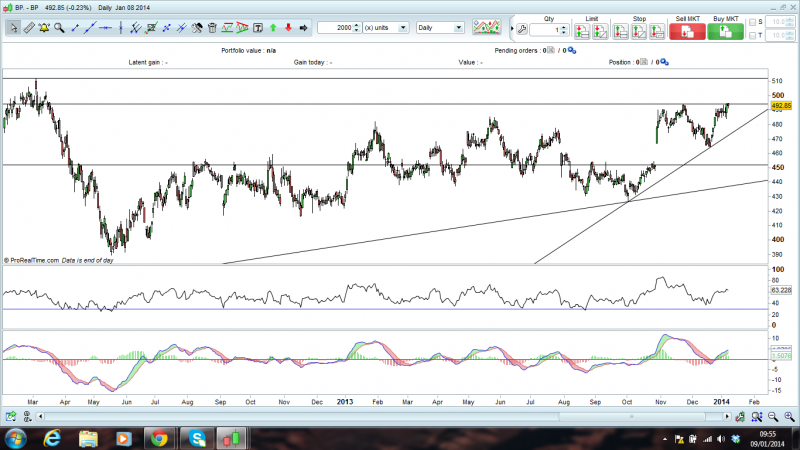 Good support in this area, so should see at least a bounce of some sort. I also agree with this analysis. Having a look at the weekly, there are some clear support area's correlating in the 255-264 region as per attached chart. I also plan on going long, but it will be a short term trade due to the clear break of the RSI trendline in correlation with the oblique trendline on the chart. This is looking quite bearish at the moment. 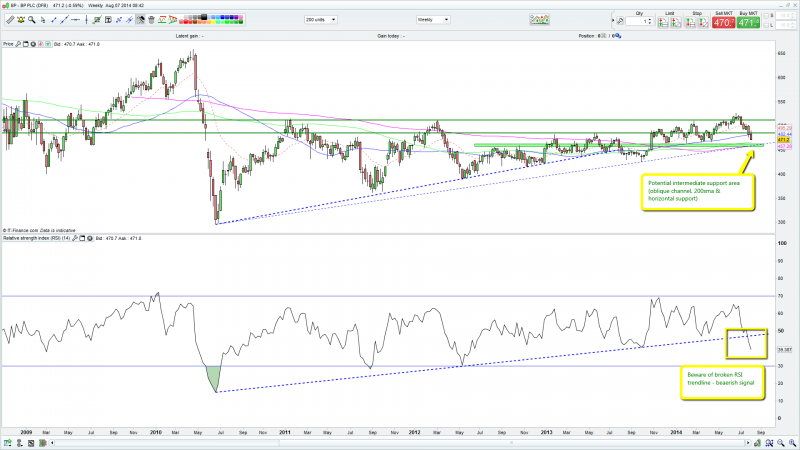 Trendline broken, bearish divergence, 200 day ema pierced. 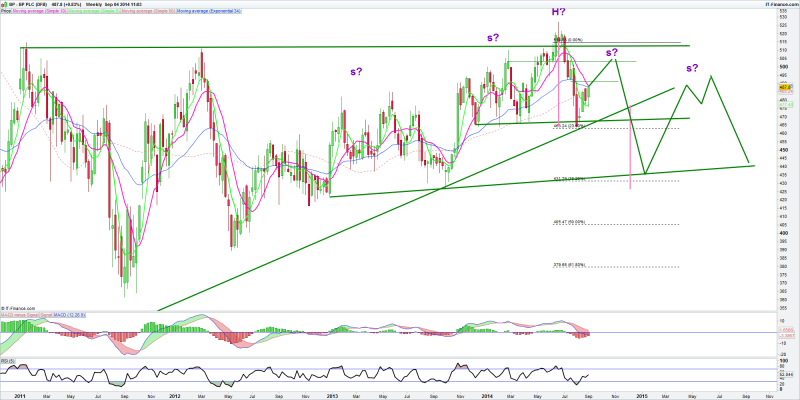 Min target support at 465p area which has beeen good support, and the area i was looking at initially. However i think this will continue downwards and have some kind of bounce at the 454p on the gap fill. Even this bounce could be short lived, and this could quite possibly continue lower. Worth a long trade at 454p area imo, but this is very much in bear mode ATM. Only a break back above the trendline and 200day ema, which change this. Thanks RC, volumes picking up too. I think you're right. I'll close at around b/e and wait for this. Thanks again. Entered short speculating on a fall back from resistance at 510. May increase if the price reaches 514.5. I've annotated the chart. This is approaching a important level of support. Around 464p. Sorry not sure how to download the chart, link above. This seems to be dropping a fair amount. Supports and resistance, and good Long entry points if possible please. I'm long now. Target 512p. Stop below yesterday's low.